Here's a very interesting article about four Korean exchange students in Arkansas. 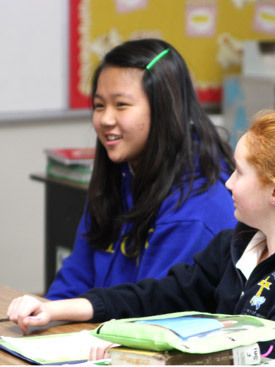 (Feb. 5, 2011) - Four students traveled more than 6,800 miles to spend a month as part of the first Korean exchange student program at Immaculate Conception School in North Little Rock. The three girls -- Seohyung "Sarah" Yeon, Kyuhee "Alley" Kim and Ahyungee "Amy" Yoo -- and one boy, Jaekyung "Jake" Lee, are exceedingly polite, gentle and reserved, but all are eager to share their culture with others and learn about their fellow students. "It was very interesting and very fun," Jake said. "It is very interesting what they know about my culture. It was very fun to tell our culture." Of the four students, only Amy is Catholic, so the students learned about American Catholicism as well as culture and education. Jake, the oldest of the four, is the most comfortable speaking in English. He is in eighth grade at home, and seventh grade at Immaculate Conception School. His cousin, Sarah, also came to the program. She is in fifth grade at Immaculate Conception and sixth grade back in Korea. Alley and Amy are both in fourth grade at Immaculate Conception and fifth grade back in Korea. Linda Jung, a member of Immaculate Conception Church in North Little Rock and part of the Korean community that has Mass and fellowship twice a month at Immaculate Conception, organized the student exchange. In Korea, she had a private school and organized exchange programs there in 2001 and 2002 with Carlisle (Lonoke County) schools. In 2003, she moved to Arkansas so her daughters could go to school here. She is now an American citizen herself. Pastor Father James West lived in Korea in his early teens and celebrates Mass in Korean for the community. The exchange program, which was held from Jan. 4 to 29, not only taught the Korean children about America, it also taught the American children about Korea. "The kids really want to know about their culture, what their school was like, what their school day is like," said principal Marcia Brucks. "It's made our students a lot more curious. They want to know more about Korea because they've met kids from Korea. And they want to know more about what happens there. I've had a lot of kids who said they want to go over there." The students learn from each other, as they become friends. "Yesterday, I made a sheet about Korea and showed all of the students in our classroom," Alley said. "They are happy to get it. This makes me happy." It was an opportunity to expand the horizons for all of the children, Father West said, and leave an impression on the Immaculate Conception students. "This way our children here will always remember Korea. They are very interested in it now," Father West said. "Korea is a fascinating, beautiful place and it's a place not as well known as other places in Asia to Americans." The children are still far from home and said they miss their mothers and pets. Sarah's fifth grade teacher, Linda Bridges, worried about her at first, as she seemed withdrawn and hardly smiled. "She looked sad and lonesome. I asked what she missed most about Korea and she said 'my dog.' So then came Jack," she said. Bridges bought her dog, Jack, to class to help Sarah. He brought her out of her shell. "She's been much happier now," Bridges said. "She didn't smile for a little bit and now she smiles all the time." Sarah's beamed a huge smile and immediately patted Jake's cropped tail. "I like Jack. I will miss him," she said as she continued to pet his head. "Jack barks in Korean now," Father West said laughing. The fact that her teacher would do something like that, Sarah said, was wonderful. "I was surprised that Mrs. Bridges brought her dog to the classroom. I'm so happy about that, that my teacher would do it," Sarah said. Their Korean teachers would never allow a dog in the classroom, she said. "Usually here, no also. Usually we don't do that. She did that for you, Sarah," Father West said. The four students are from Cheongju and Uijungbu in South Korea, south and near Seoul respectively. They are on winter break in January. Traditionally during winter break in Korea, students don't vacation. "A lot of the kids in Korea will have other educational things they're involved in during the winter break," Father West said. "For us, we would hear 'winter break: yea, there's no school.' In Korea, winter break a lot of time means you're out of school, but you go find other things to learn." Now that they've become a part of the school family, they hope to return again next year. "I asked them if they are anxious to get back," Father West said. "They all said 'No, we would like to stay here.'" Jake said he hopes to attend college in America and wants to return to Arkansas again. The community atmosphere at their American school is something all the students said they loved. "They help me," Alley said. "They help each other." In Korea, the schools have an average of 30 to 40 students a classroom. The academic environment is competitive. "In Korea, especially smart kids, don't want to share their things," Jake said. "Here they share many things." Maneuvering in the English-speaking world was harder than they expected, but they have improved dramatically from when they arrived early in January. Each teacher assigned the exchange student a classroom buddy. "We had each teacher assign a buddy for each student when they got here, so they each had an assigned classroom buddy to specifically make sure they weren't alone or left out," Brucks said. "They bonded with their buddies pretty well, along with the other students too." Jung threw the students and their buddies a party at a bowling alley to celebrate before the Korean students returned home Jan. 29. "I have played bowling on Wii," Jake said. "But real one, is first time." Sarah wrote all her classmates names in Korean and shared it with them. "They asked me if they could write their names in Korean now," Bridges said. "And I said, 'Sure, as long as you put your American name too.' I can't read Korean yet." All of the exchange students said they will miss their new friends and teachers. They want to send pictures of their school and friends in Korea to their American school family. "Yes, I will send e-mail back to my friends when I go back," Amy said.